Beginning the early eighties I decided to take on the big and the powerful by taking action against the corrupt government within the County of Los Angeles. It did not take long to discover why government corruption proliferated within the County of Los Angeles, and that was because all of the corruption in the government was being covered up by the Los Angeles County judges. Unknown to me, I did not realize that basically all judges in Los Angeles County were on the take. I even had the naivety to believe that when I got to the Courts of Appeal, the justices would swallow their Adam’s Apple out of disbelief at what was happening in the court below them, and that they would straighten everything out. But, what I learned was that the judges do not get promoted upwards unless they are in on the game. I soon found myself focusing myself not upon government corruption, but upon those covering up for government corruption, i.e., the courts. I learned that all government corruption is founded up, and hosted by the judges starting from the trial level, going upward to the United States Supreme Court, of which I have now approached fifteen times with all the same results – fraud and cover up! I concluded that there could not be one in a million that was getting the experience I was. While all court corruption generally originates with government corruption, government corruption is irrelevant in light of the greater problem with the judiciary. So, I begin suing the judges, which suit would always go before another colleague judge. That judge, Judge “B”, always determined that Judge “A” could not be sued no matter what. I then realized that the problem was not corrupt judges, but a corrupt doctrine created by the judges to mutually protect for one another. I began to focus in on the real problem, a doctrine that completely undermined the Supreme Law of our Land. Every judge, whether federal or state, theoretically raised their right hand and swore by an Oath to uphold the Constitution, and then, on the other hand, then contend that no judge is accountable to the Constitution when they violate it because these most honorable judges cannot be held accountable because of Judicial Immunity. While there are cases that say that judges do not enjoy judicial immunity if their acts are beyond their jurisdiction, I discovered by experience, that judges are not only not subject to the Constitution, but also not subject to any interpretation of jurisdiction. Our Founding Father’s wisely designed our government with three distinctive branches, the judiciary being one of them. They also wisely provide for us a theoretical recourse of action for every wrong through the right to redress of grievances. This “right” not only preserved petitioning to Congress, but also petitioning the Courts. Therefore, we as an insignificant “David” could go to court with any grievance against a “Goliath.” This is the way our government is supposed to work. But reality dictates otherwise. In all my years of taking on big government and the judiciary, it dawned on me that had I been in most any other geographical jurisdiction other than Los Angeles County, I would have single-handed bankrupted that jurisdiction. The County of Los Angeles is as mega-corporation operating with a budget of billions of dollars to maintain its stronghold over a population that exceeds that of forty-two other states within this Union. In effect, I reside within the heart of Sodom and Gomorrah without access to a judicial remedy in which to petition to. 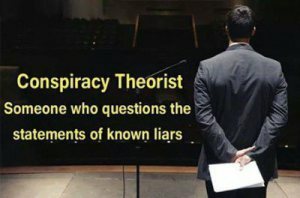 For those unaware, the entirety of all of America’s major media, whether newspaper, radio, television, or billboards, is bought up by a few major corporations, and are not presenters of the news, but rather propaganda voices for their interests, which is in keeping things just the way they like them. Essentially, if these corporation do not cover an event, the event did not happen, regardless of the evidence. Us small guys, the “David’s” are simply not heard. Yet, I hear naive People clamoring, “We need to reach the media.” They do not realize that the media is their enemy. They also clamor for the attention of Congress, not realizing that they too are their enemy. “…judgment is turned away backward, and justice standeth afar off: for truth is fallen in the street, and equity cannot enter. Yea, truth faileth; and he that departeth from evil maketh himself a prey:” Isaiah 59:14 & 15. My response is the same judicial accountability remedy I proposed in April of 1995. The remedy has not changed. But that is not what the People want to hear. They are looking for some esoteric “remedy,” a “Silver Bullet” that will cost them nothing! Believe it our not, I have even been opposed on a radio program with the words, “Your cost is too high!” Make no mistake about it, Ron Branson wants your lives, your fortunes, and your sacred honor! Ron wants your all! In exchange, I, Ron Branson, will give you your country! Here is how I have penned the specific method for you to accomplish this. Yes, we can fully expect that. But you just take your redress on up on appeal. But you say, the Appellate Court will uphold the offending trial court below. Yes, we fully expect that. So you just take your petition for redress on up to the State Supreme Court. But you say, the State Supreme Court is going to uphold the decisions of the Appellate Court. Yes, again, we fully expect that. But here is where the game-changer takes place! Now that you have exhausted all judicial remedies within the court system, through JAIL4Judges you now have access for redress of grievance before 25 just plain regular citizens who are neither law enforcement individuals, members of the Bar Association, judges or politicians. It is “JUST US” in the true sense of the word. This Independent Special Grand Jury created by J.A.I.L. will offer to the offending judge(s) an opportunity to put on their defense to your charges against them that they did not violate any Constitutional due process procedures of law, and if they did so, it certainly was not willful. This grievance question is decided by 25 citizens of your own peers, and if only thirteen of “JUST US” plain citizens are not convinced by the defense arguments of the offending judges(s), then you have successfully scored a point toward taking on the “GOLIATH” Corporation of Viacom. But, you say, I then have only begun to prevail against the offending judge(s) who have done me wrong in my suit against VIACOM. Yes, but now you have opened a whole new door to a suit in conspiracy involving not only VIACOM, but also the judge(s) involved in the cover up conspiracy with VIACOM. – Ouch! They may likely have to dig into their deep pockets and settle up with little ole you to get you off their backs. And now the judge(s) are barred in their defense from arguing that they are covered by judicial immunity and cannot be held liable. Another Ouch! 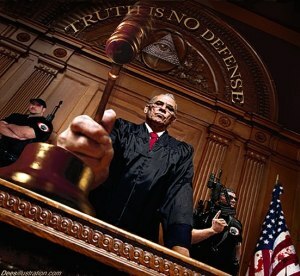 JAIL4Judges is the “stone” from David’s sling shot that will slay the Corporate News Giant of Goliath! This is more valuable than if “David” won the Lottery! With the win from Viacom, “David” can now go after NBC, ABC, Fox News, CNN, or whatever. And just think, any “David” has access once again to redress of grievance, and can now enter in into the objective of returning freedom not only for his personal interests, but for this entire country! WOW! The benefits of this through this “David v. Goliath” method is beyond most anyone’s imagination. But it must start with you, the People, “mutually pledging to each other your lives, your fortunes and your sacred honor.” You must determine if that cost is too high! American government is hopelessly corrupt throughout all three branches, left, right, down the middle, top to bottom. And yes, the Injustice system gives cover to the evil. Attorney General Eric Holder made that very clear in stating the big bankers will not prosecuted because they control the money, even as they are known guilty of massive mortage frauds, laundering billions of narco-dollars, double-booking, bribery and outright theft. It is most galling, and cause for us to remember the principles cited in the Declaration of Independence and act upon them! Truth, Justice, & Liberty require vigilance and courage, sometimes blood!